Together, Picasa & Picasa Web Albums make it easy for you to organize and edit your digital photos, then create online albums to share with friends, family & the world. Picasa for Mac makes it easy for you to get the best out of your color printer on Mac OS X. 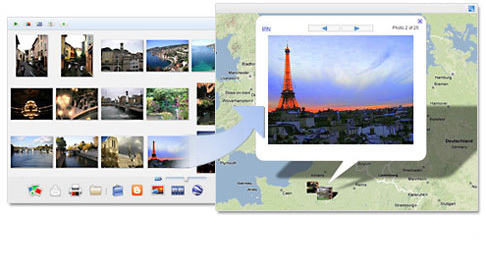 And Picasa Web Albums gives your friends the ability to download full-resolution pictures, so they can do the same. When ordering online, choose freely between major retail services. ...... and works in Picasa and Picasa Web Albums. Use Picasa to design and print beautiful photo collages, create fun video slideshows, add photo text or view your favorite photos on your desktop or screensaver. Picasa is free to download, and Picasa Web Albums provides 1 gigabyte of free storage -- that's enough space for 4,000 wallpaper-size photos. Publish your favorite photos online with one click. Create stunning online photo albums to share with friends and family, or public albums for the world to see. Get notified when your "Favorites" post new photos. Qweas is providing links to Picasa for Mac 3.9.0.135.86 as a courtesy, and makes no representations regarding Picasa for Mac or any other applications or any information related thereto. Any questions, complaints or claims regarding this application Picasa for Mac 3.9.0.135.86 must be directed to the appropriate software vendor. You may click the publisher link of Picasa for Mac on the top of this page to get more details about the vendor.